The dunes of the southern Oregon Coast are free of any vegetation, while Bayocean has some very large old spruce and pine on its northern, hilly, forested section. The salal, huckleberry, and other undergrowth would have followed the establishment of those trees, because they require shade to survive. When might the trees have arrived? Obviously, sand dunes must stabilize (stop growing and moving) to some degree before vegetation can take hold. So it would have to have been after Bayocean started shrinking, as discussed in Pre-historic Geomorphology of Bayocean Peninsula. Photos taken when the town was being built show trees; and sales brochures featured them. In Coastal Sand Dunes of Oregon and Washington, William Cooper noted that when he visited Bayocean Park in 1928 it was "fairly well covered with brush and grass, and there were a few young pines and spruces upon it." On April 1, 1857 General Land Office surveyor Samuel Snowden noted a 16" pine in his field notes, while working on Bayocean. 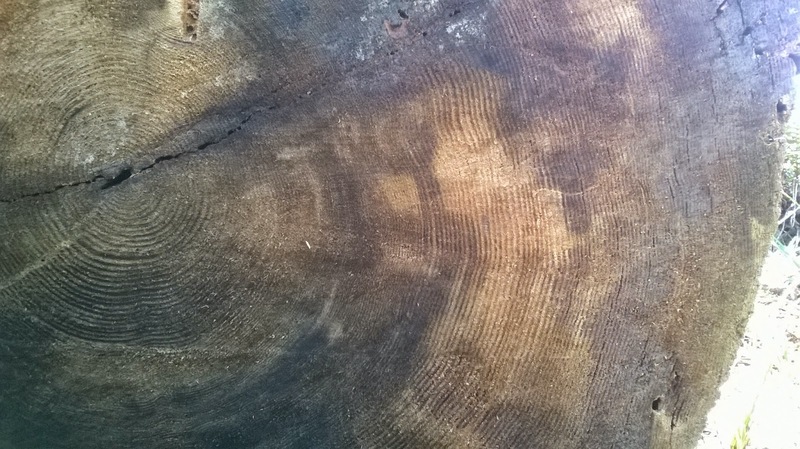 Various web sites use 5 years per inch of diameter for pine and spruce, which matches the rings per inch I found on an old log next to the Dike Road February 24, 2015. Based on this ratio, the pine that Snowden saw was about 80 years old. We can estimate that it sprouted in 1777 and that Bayocean has been vegetated for at least 238 years. But Paul Levesque thinks it more likely the tree photographed got there due to heavy flooding after 1934, due to the Tillamook Burns. Heavy rain landing on bare soil washed logs down into the rivers, that took them into the bay. Some likely ended up in the low spot across the Dike Road during a flood, and could not return when the water receded. At the other end of the spectrum, the natural ecological cycle has brought trees back to the southern dunes of Bayocean more recently. Photos taken by Bert and Margie Webber, and published in their Bayocean: The Oregon Town that Fell Into the Sea , show dunes covered with grasses and Scotch broom, but no trees. If the photos were taken before the original 1989 edition, the shore pine and shrubs present today are less than 36 years old in 2015. If the photos were taken just prior to the book's 1992 revisions, the trees are less than 23 years old. It's nice to see young'uns when admiring the old timers.